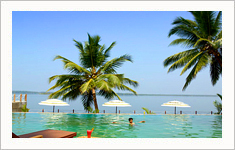 Tranquil, tropical and tree fringed – Cambay Palm Lagoon is a six acre paradise on earth. Nestled in a coconut palm forest, on the shores of the azure Ashtamudi Lake - the second largest water body of kerala is your haven away from home. 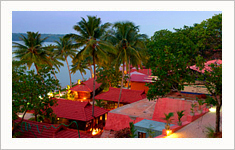 An enchanting holiday resort in a naturally landscaped peninsula. 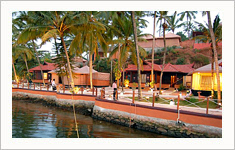 The resort is really an isolated piece of world with very calm and pleasant nature from where you can see sunrise and sunset from a single point. A panoramic view of a number of tiny islands blanketed by green vegetation gives an unforgettable experience. 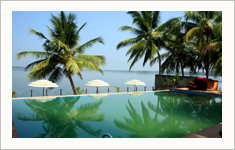 A houseboat is one of the best ways to take pleasure in the picturesque beauty of the renowned backwaters of Kerala. 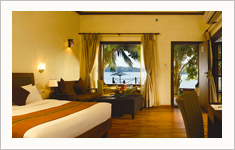 Unwind in the privacy of your own mini-paradise on the Ashtamudi Lake, offering well-crafted interiors, a dining area, two bedrooms and state of the art amenities to complete an enchanting holiday experience. Take in the breathtaking view or just kick back and relax in the well appointed and exquisitely furnished floating cottages. Also on offer are all the amenities of a traditional cottage, adding to the incomparable "floating". 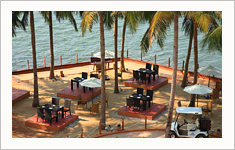 Indus Multi Cuisine Restaurant: Savor culinary temptations in an enchanting gazebo with a breathtaking view of the sun sinking into the Ashtamudi Lake. 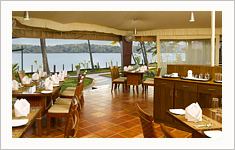 Let the veteran chefs churn out exotic delicacies for you from across the globe.